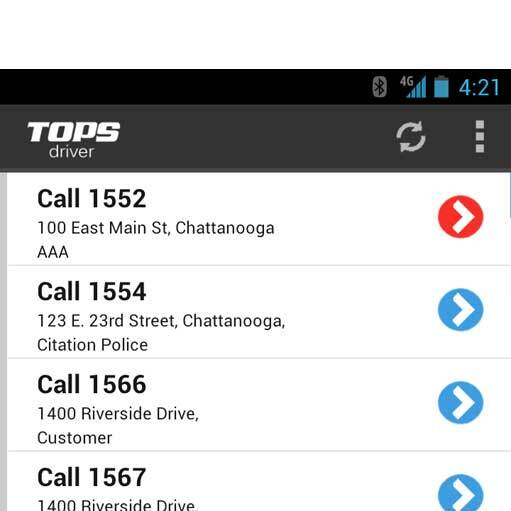 TOPS driver is a free mobile application accessible through the use of any Android device, allowing tow drivers access to their calls being worked in the field. TOPS driver offers real-time call updating without the need for voice communication via radio or telephone with the dispatch office. This tool is extremely helpful in accurately recording arrival times where ETAs are important, updating call information, taking images and navigation to the breakdown location. TOPS driver allows for remote access to TOPS creating a more efficient dispatch operation. Over 1.4 Million calls worked through TOPS! We couldn't run our operation without it! I would tell any tow company owner who is in the market for new software to give TOPS a try. We put a lot of time and effort in to choosing the best company and we believe we have. The staff at TowXchange helped us transition smoothly from our old software to TOPS and have always been very quick to respond whenever we had questions. Their customer service is impressive. Our dispatchers absolutely love the BudgetGPS integration with TOPS and new TOPS driver mobile application. They dispatch more efficiently than ever before, AND they get real-time status updates from the driver. Get a handle on your business with TOPS towing management software. As the most full featured and flexible towing management software on the market, TOPS provides a powerful way to manage your business. towXchange serves municipalities by providing solutions for managing auto pound operations. Our products provide contractor accountability and full transparency, while reducing costs and providing better service to the community. towXchange offers a complete suite of integrated solutions for connection Municipalities and Law Enforcement agencies with private towing providers. Our software provides full accountability and transparency, while reducing costs.